Mitsubishi has had around half a centuries worth of motorsport experience on the international stage. Mitsubishi Motors have been involved with motorsports since they were formed in the 70s but began to focus more on the off road side of things before too long dominating endurance races for the first decade of Mitsubishi Motors’ life. Mitsubishi Motors created the Lancer 1600 GSR in 1974 specifically to tackle the East African Safari Rally, an event which is viewed as one of the most painstaking challenges in World Rally Championship History. The Lancer got off to the perfect start winning the East African Safari Rally and it went on to have a very successful decade, taking the top 4 places in the 1973 Southern Cross Rally and a podium clean sweep in 1976. Since the 70s Mitsubishi have continued to make their mark on the world rally stage with the Lancer as well as scoring outright victories in Group A with the Galant VR-4 in the early 80s. The Lancer made its return in the 90s and won Mitsubishi the manufacturer’s championship in 1998. The Lancer also won 7 Group N title consecutively from 95 to 2001 with the Proton breaking the streak in 2002, a Proton which used the Lancer Evo-based Pert. 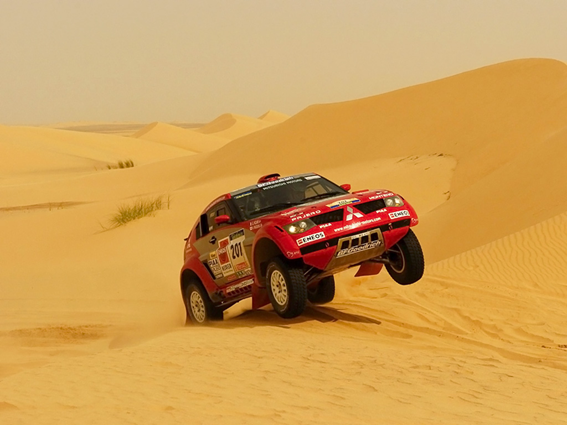 Mitsubishi also has an impressive history in the Dakar Rally, another event filled with danger. They have been hailed as the most successful manufacturer in the history of the Dakar Rally, dominating it since the early 90s with the Pajero, taking the title in 1992, ’93,’97,’98 and ’01-’07.